Is your house looking a little worse for the wear? Are you starting to think about moving? Your new house may be hidden right before your very eyes. The design and construction team at Pagenstecher Group, specialize in whole house renovations. More than just cosmetic upgrades, a whole house renovation can completely transform a house both inside and out! Some people love older homes because they have a unique character and a level of detail you rarely find in new construction. But they may have some shortcomings as well. We can help you develop a strategy to address your home’s flaws while preserving and enhancing its best features. Others may prefer newer construction homes because of their casual style and open plans. However newer homes often lack the craftsmanship and charm found in an older home. Believe it or not, some newer homes are “too open.” Our team can work with you to create one-of-a-kind details that add definition to your open plan. New or old, our team of designers and master builders will work hand-in-hand with you to translate your vision of the “perfect home” and make it a reality. Let us show you the opportunities that lie hidden within your home. Many area homes are quite compartmentalized, lacking the openness and multi-use space popular with today’s lifestyle. Let the team at Pagenstecher Group show you how to remove unnecessary walls within your home to transform its function and flow. On top of that, our design staff will help tailor the scale, proportion and finish of each room to suit your every need. But why is an open plan so appealing? We all lead busy lives with a never-ending list of commitments and activities, so the ability to multitask is key. Whether helping with a school project while you are preparing dinner, or watching the big game while paying household bills, an open plan gives you flexible space that’s adaptable to the changing needs of your family. With over 30 years of experience the team at Pagenstecher Group can help you develop the best strategies to open and connect your home. Have you ever visited a home and immediately felt like it perfectly fit its owner? Home customization is a great way to put your own unique stamp on your living space. Are you a collector or reader? Do you love color or bold patterns? Highlighting the elements of your life and family that are most important will make your house special. Carve out space for a wine cellar or library nook. Install custom built-ins in the family room to display the treasures of your travels. Add a wet bar if you love to entertain. Build a screen porch to expand your living space into the outdoors. These are but a few of the many options that can be explored when customizing your home. Clients engage Pagenstecher Group because we add a level of detail and service you won’t find anywhere else. Our collaborative process focuses on every detail to ensure your house fits you perfectly. A lot of homes have plenty of space but suffer from a lack of cohesion. A jumble of different architectural styles and competing aesthetics can fracture a home into a collection of rooms unrelated to one another. In this instance, less really is more. A whole house renovation can reconnect your home without making major changes to the footprint. Developing a common language with trim details and millwork is often a good place to start. Finish materials and color can also play a key role in defining a unified aesthetic throughout your home. No matter what your style, the staff at Pagenstecher Group can transform your home into an artful expression of you. The outside of your home is just as important as its inside. Some might refer to this as curb appeal, but it’s really much more than that. When you drive up to your home do you feel welcome? What is the entry sequence for family and guests? Is it a pleasant experience, or not? Our mood is dramatically affected by the environment around us, and a whole house renovation can turn a drab exterior into an inspiring event you get to enjoy coming home to every day. Take for example this Bethesda home makeover. Though the house had a roomy interior, from the outside it looked and felt very small. Set back from the street, the house lacked detail and a street presence. Today the house has a new found richness and grandeur. 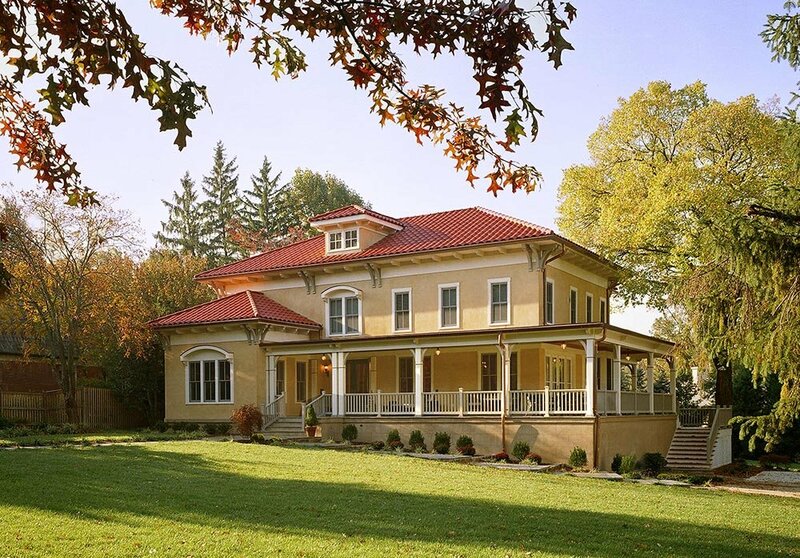 Inspired by the owner’s heritage, the Italianate-styled exterior puts detail on full display. Traditional clay tile roofing, ornate cornice work, re-proportioned windows, and a sizable wrap around porch are but a few of the unique details that now catch your eye as you approach the home. Can you imagine what it would be like to live here?